A few things that might make watching the Golden Globes more fun tonight. Want a complete list of nominees? Click here. 1) Look for drunken behavior, slurring and forgetfulness during the acceptance and/or presentation of awards. The Golden Globes are always a lot more fun than the Oscars for one simple reason: Booze. The stars sit at round tables and get loaded during the festivities. This explains why starlets are usually in the loo when they are called up to accept their award. 2) Tonight's presenters include Lindsay Lohan, who's apparently over her coke binge asthma attack; the totally predictable irrepressible humor from the cast of Will & Grace; the startling fashion snafus savvy of Gwyneth Paltrow. Oh yeah, and Mariah Carey's presenting too. This pretty guarantees that someone will do something regretable. 3) Play the "Yep, You're on Camera" Drinking Game. The rules? When the camera pans on a star, take a sip when they smirk, wink, grin or raise an eyebrow at the camera; two if they smile with stomach-churning false modesty; three if they holding up some bubbly. Polish off your entire drink if they turn screentime as their own personal mirror, and check their teeth for spinach. 4) Unfortunately, America not terribly progressive, even if Brokeback Mountain sweeps the awards. The electoral body, in this case, are the totally obscure members of the Hollywood Foreign Press Association. They may influence the heartland, but are hardly cut from the same cloth. Share your pics for the worst dressed star of the night. We'll try and do the same. One lazy Saturday, we caught an episode of My Super Sweet 16 on MTV -- a show about how spoiled teens plan their 16th birthday parties. • Hysterics about parents ("They're so mean! "), rivals ("I can't believe she wants an invitation!") and crashers ("Let them eat cake!"). Well, turns out she was right. A 13-year-old in New York just got Daddy to book two floors of the Rainbow Room for Mitzvahpalooza. 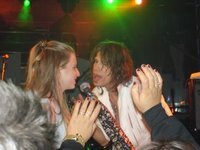 Her party planners then tapped 50 Cent, Stevie Nicks, Don Henley and Aerosmith to serenade the kid. Her Daddy wasn't mean at all. And how did Daddy afford all this? He's a defense contractor, of course. We hate it when this happens, but the nomination of hyperconservative Sam Alito means we no longer have the luxury to mock the Supreme Court with our feeble stabs about Hallmark cards and make-up faux-pas. Alito's nomination brings Roe v. Wade - an issue Bush wanted to avoid - into sharp focus. Christian Conservatives are spoiling for a public battle on this issue, and they're about to get their wish. Here's the NYT's link list to important political blogs - ones that rarely make cracks about eyeliner - that explore where the battle lines are being drawn. And damn those Christian Conservatives. They've managed to bait us right out of normally somewhat sarcastic, aloof stance. If this is one fight you -- like me -- won't be able to back away from, head over to Planned Parenthood's blog to prepare for battle. Meanwhile, we'll start combing Alito's past to find a few embarrassing personal quirks. Anyhoo, we've compiled a short list of why it feels like Santa's come early. Normally, I love this time of year, and can't wait to show off my new fall outfits. But, when I went to update my wardrobe the other day, I instantly got woozy. I popped two Xanax, but this was no ordinary panic attack. This was a full-blown reaction to the godawful accessories we're expected to wear this season. Anyway, my point is that the "great" outdoors are a sham. Mother Nature is a malicious old hag with a single purpose -- to mess with our collective human buzz. 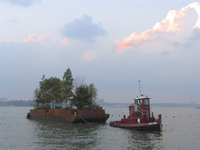 My vision of utopia can be summed up by Robert Smithson's new public art piece, Floating Island. This is exactly how nature should be enjoyed! By confining the wilderness to a single barge, we'd be able to limit the many ways that it has of spoiling the mood. Seems the White House is looking for a new target to take the heat for Katrina: The media. He goes on to imply that the White House's superslow response to the NOLA crisis occurred because the media (the media?!) had lulled him into a false sense of relief. Meanwhile, the Wall Street Journal quickly puts the kibosh on the latest bit of his nonsense with a thoughtful and extensive play-by-play on how the coverage unfolded on the news channels. Put simply: Don't blame the messenger.